AUTOSAVER88 - 12inch maximum fan cfm: 1730 cfm Fan Diameter in: 11. 73 maximum fan rpm: 2250 rpm number of Blades: 10 blades Thickness in: 2. 36 blade material: plastic amp draw: 12 amps; watts:80w 14inCH Maximum Fan CFM: 2000 CFM Fan Diameter in: 13. 82 maximum fan rpm: 2250 rpm number of Blades: 10 blades Thickness in: 2. 56 blade material: plastic amp draw: 12 amps; watts:90w 16iNCH Maximum Fan CFM: 3000CFM Fan Diameter in: 16. 73 maximum fan rpm: 2250 rpm number of Blades: 10 blades Thickness in: 2. 56 blade material: plastic amp draw: 12 amps; watts:120W Package Includes: Radiator Fans Fan Mount Kit Overall diameter:16. 16" High Performance Black Electric Radiator Cooling Fan Assembly Kit 2000 CFM Pro-Cool Reversible Heavy Duty S-brade Engine Fan Mounting Set （Diameter 16.73" Depth 3.26" - 73 inch, overall thickness:3. 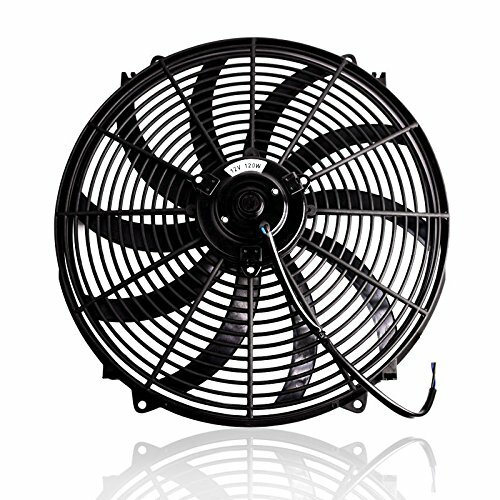 26 inch ;2000 cfm car cooling fans:amp Draw:6-7 amp ;Watts:120W. High-quality, lightweight, and durable; great as replacement or upgrade from factory parts. Simple installation, no modifications required. Product description: aids to cool the entire Engine Bay, Intercooler, Oil System, including Radiator, A/C System, and Transmission. Fan can be used as pusher or puller with the adaptable mounting kit. How to choose the correct fan?step 1:confirm the width and depth of your radiator step 2:compare the fan diameter and depth with radiator Step 3: Choose the right size fan ATTENTION:It can be installed only if the diameter of the fan is smaller than the width of radiator! Make sure the depth of the fan is smaller than the gap of radiator and other parts! Partssquare - 1. Mount the relay under the hood in a convenient location as to the fan as possible. Notice:don't use the teflon tape or thread compoud on the thermostat or adaptor. For proper operation, the thermostat must ground threough the threads to the engine and the engine must be ground. 3. Route and connect the red wire to the fan "+" terminal or power wire coming from the fan motor printed "to electric fan". Cut to length and install using a small yellow ring terminal. With another small yellow ring terminal take the remaining red wire and connect the unused post on the circuit breaker to the battery source. This wire is printed"to battery/constant hot" 6. Route the brown wire to the ignition switch or the fan switch whichever is more convenient. Partssquare 175-185 Degree Electric Cooling Fan Thermostat Kit Temp Sensor Temperature Switch 40 amp RELAY KIT - 5. Neatly route the red wire from the relay to one side circuit breaker installed in step 5. New 175 - 185 degree electric fan thermostat relay switch kit for your cooling system, It is a 3/8" pipe thread. This kit includes everything you'll need to hook up to your fan, relay switch, circut breaker, includes a brass adapter to install the sending unit, wires, terminals and mounting screws. This kit is set up to turn your electric fan on at 185 degrees and shut off at 175 degrees and will work with any 12 volt system. High quality replacement Part, have no-worry 12 months warranty. Derale 13001 - Kit contains 4 plastic rods with hardware. New 175 - 185 degree electric fan thermostat relay switch kit for your cooling system, It is a 3/8" pipe thread. This kit includes everything you'll need to hook up to your fan, circut breaker, includes a brass adapter to install the sending unit, relay switch, wires, terminals and mounting screws. This kit is set up to turn your electric fan on at 185 degrees and shut off at 175 degrees and will work with any 12 volt system. High quality replacement Part, have no-worry 12 months warranty. Complete mounting kit for mounting a cooler or electric fan. Replacement for : 265 283 305 307 327 350 383 400 396 402 427 454 472 502 260 289 302 351w 347 352 360 390 406 427 428 429 460 351c 351m 400m 273 318 340 360 361 383 400 413 426w 440 455 330 326 ENGINES. Derale 13001 Plastic Rod Mounting Kit - . These sturdy nylon electric fan and transmission cooler installation kits include 4 plastic rods, 4 clips, and 4 foam mounting pads to provide a solid trouble-free and installation-friendly method of securing an electric fan, transmission or engine oil cooler to any vehicle. PartsSquare - Replacement for : 265 283 305 307 327 350 383 400 396 402 427 454 472 502 260 289 302 351w 347 352 360 390 406 427 428 429 460 351c 351m 400m 273 318 340 360 361 383 400 413 426w 440 455 330 326 ENGINES. Comes on at 200 degrees and turns off at 185 degrees, It is a 3/8" pipe thread. This kit includes everything you'll need to hook up to your fan, includes a brass adapter to install the sending unit, circut breaker, wires, relay switch, terminals and mounting screws. This kit is set up to turn your electric fan on at 200 degrees and shut off at 185 degrees and will work with any 12 volt system. High quality replacement Part, have no-worry 12 months warranty. All items pictured above included: 50 amp relay 48" of wiring 12-18 gauge temperature sensor circuit breaker assorted connectors and terminals comes on at 200 degrees and turns off at 185 degrees compatible with 265 283 305 307 327 350 383 400 396 402 427 454 472 502 260 289 302 351w 347 352 360 390 406 427 428 429 460 351c 351m 400m 273 318 340 360 361 383 400 413 426w 440 455 330 326 engines this kit is a must have when using an electric fan in your hot rod or street rod compatible with most hot rods and classics engines including gm chevy, gmc, ford, olds, dodge, cadillac, buick, & mopar chrysler, pontiac, plymouth please measure to make sure this is the right size as 7" 10"12"14"16" electric fans replacement for : 265 283 305 307 327 350 383 400 396 402 427 454 472 502 260 289 302 351w 347 352 360 390 406 427 428 429 460 351c 351m 400m 273 318 340 360 361 383 400 413 426w 440 455 330 326 ENGINES. PartsSquare 185 To 200 Degree Electric Fan Thermostat Sensor Temperature switch 50 amp Relay Kit - . New 175 - 185 degree electric fan thermostat relay switch kit for your cooling system, It is a 3/8" pipe thread. This kit includes everything you'll need to hook up to your fan, includes a brass adapter to install the sending unit, circut breaker, relay switch, wires, terminals and mounting screws. This kit is set up to turn your electric fan on at 185 degrees and shut off at 175 degrees and will work with any 12 volt system. CISNO FBA_CP202AC - 3. Route and connect the red wire to the fan "+" terminal or power wire coming from the fan motor printed "to electric fan". Note:for the two red wires, please connect the long red wire to the fan and the short red wire to the battery. 3. Avoid sprinkling water on surrounding auto parts during the installation. Specification:voltage: 12v dc material: plastic and Metal Package Box Size: 13 x 9 x 7cm L x W x H Cable Length: approx. 165cm quantity: pack of one set package include: 1× fan temperature switch replacement for : 265 283 305 307 327 350 383 400 396 402 427 454 472 502 260 289 302 351w 347 352 360 390 406 427 428 429 460 351c 351m 400m 273 318 340 360 361 383 400 413 426w 440 455 330 326 ENGINES. Fan Thermostat Temperature Switch Engine Cooling Sensor Relay Kit 185 to 200 Degree - New 175 - 185 degree electric fan thermostat relay switch kit for your cooling system, It is a 3/8" pipe thread. This kit includes everything you'll need to hook up to your fan, circut breaker, wires, includes a brass adapter to install the sending unit, relay switch, terminals and mounting screws. This kit is set up to turn your electric fan on at 185 degrees and shut off at 175 degrees and will work with any 12 volt system. Hayden Automotive 3652 - 185 degree Fahrenheit preset thermostatic fan control. This kit includes everything you'll need to hook up to your fan, circut breaker, relay switch, wires, includes a brass adapter to install the sending unit, terminals and mounting screws. Fits for 265 283 305 307 327 350 383 400 396 402 427 454 472 502 260 289 302 351w 347 352 360 390 406 427 428 429 460 351c 351m 400m 273 318 340 360 361 383 400 413 426w 440 455 330 326 Engines. For use with Rapid-Cool and super duty electric fans. Comes on at 200˚ and turns off at 185˚. This is a 185 degree Fahrenheit preset thermostatic fan control. Kit contains 4 plastic rods with hardware. Replacement for : 265 283 305 307 327 350 383 400 396 402 427 454 472 502 260 289 302 351w 347 352 360 390 406 427 428 429 460 351c 351m 400m 273 318 340 360 361 383 400 413 426w 440 455 330 326 ENGINES. Hayden Automotive 3652 Preset Thermostatic Fan Control - Comes on at 200 degrees and turns off at 185 degrees, It is a 3/8" pipe thread. This kit includes everything you'll need to hook up to your fan, circut breaker, includes a brass adapter to install the sending unit, relay switch, wires, terminals and mounting screws. This kit is set up to turn your electric fan on at 200 degrees and shut off at 185 degrees and will work with any 12 volt system. High quality replacement Part, have no-worry 12 months warranty. 185~200 degree electric fan thermostat relay switch kit, It is a 3/8" pipe thread. Hayden Automotive 210 - Replacement for : 265 283 305 307 327 350 383 400 396 402 427 454 472 502 260 289 302 351w 347 352 360 390 406 427 428 429 460 351c 351m 400m 273 318 340 360 361 383 400 413 426w 440 455 330 326 ENGINES. For use with Rapid-Cool and super duty electric fans. Kit contains nylon mounting rods foam pads and locking buttons. Comes on at 200 degrees and turns off at 185 degrees, It is a 3/8" pipe thread. This kit includes everything you'll need to hook up to your fan, wires, relay switch, includes a brass adapter to install the sending unit, circut breaker, terminals and mounting screws. This kit is set up to turn your electric fan on at 200 degrees and shut off at 185 degrees and will work with any 12 volt system. Hayden Automotive 210 Mounting Kit System - High quality replacement Part, have no-worry 12 months warranty. 185~200 degree electric fan thermostat relay switch kit, It is a 3/8" pipe thread. 185 degree Fahrenheit preset thermostatic fan control. Hayden's quik-mount kit enables the installer to quickly mount transmission coolers, electric fans or many other components quickly and effectively. Provides quick, effective installation of Hayden products. This kit is set up to turn your electric fan on at 200 degrees and shut off at 185 degrees and will work with any 12 volt system. FAERSI - For proper operation, the thermostat must ground threough the threads to the engine and the engine must be ground. If you get any problems with our this Electric Cooling Fan Thermostat Kit, please contact us in the first time, we will response within 12 working hours. Kit contains nylon mounting rods foam pads and locking buttons. Probe installs in to radiator fins. Please notice: -Please check the compatiblity to make sure correct fitment before purchase. Comes on at 200 degrees and turns off at 185 degrees, It is a 3/8" pipe thread. This kit includes everything you'll need to hook up to your fan, relay switch, wires, includes a brass adapter to install the sending unit, circut breaker, terminals and mounting screws. 175-185 Degree Electric Cooling Fan Thermostat Kit Temperature Sensor Temperature Switch 60 AMP Relay Kit - 2 Yr Warranty - This kit is set up to turn your electric fan on at 200 degrees and shut off at 185 degrees and will work with any 12 volt system. High quality replacement Part, have no-worry 12 months warranty. 185~200 degree electric fan thermostat relay switch kit, It is a 3/8" pipe thread. Replacement for : 265 283 305 307 327 350 383 400 396 402 427 454 472 502 260 289 302 351w 347 352 360 390 406 427 428 429 460 351c 351m 400m 273 318 340 360 361 383 400 413 426w 440 455 330 326 ENGINES. Route the black wire to thermostat and cut to length. With another small yellow ring terminal take the remaining red wire and connect the unused post on the circuit breaker to the battery source. Specification: -voltage: 12v dc -Material: Plastic and Metal -Package Box Size: 13. 10" 12V Universal Electric Radiator Cooling Fan Push Pull Slim Mounting Kit 1250 CFM （Diameter 10.75" Depth 2.56"
AUTOSAVER88 - Direct fit & easy installation】this kit includes everything you'll need to hook up to your fan, includes a brass adapter to install the sending unit, wires, circut breaker, relay switch, terminals and mounting screws. Premium quality】new 175-185 degree electric fan thermostat relay switch kit for your cooling system, sending Unit Thread Size: 3/8-18 NPT, Voltage: 12 V.
Working】this kit is set up to turn your electric fan on at 185 degrees and shut off at 175 degrees and will work with any 12 volt system. Warranty】2 years no-worry warranty. High-quality, lightweight, and durable; great as replacement or upgrade from factory parts. Simple installation, no modifications required. 10" 12V Universal Electric Radiator Cooling Fan Push Pull Slim Mounting Kit 1250 CFM （Diameter 10.75" Depth 2.56" - Fan can be used as pusher or puller with the adaptable mounting kit. How to choose the correct fan?step 1:confirm the width and depth of your radiator step 2:compare the fan diameter and depth with radiator Step 3: Choose the right size fan ATTENTION:It can be installed only if the diameter of the fan is smaller than the width of radiator! Make sure the depth of the fan is smaller than the gap of radiator and other parts! Provides quick, effective installation of Hayden products. For installation of transmission coolers and electric fans. For use with Rapid-Cool and super duty electric fans. Kit contains nylon mounting rods foam pads and locking buttons. Dewhel - Professional Installation Highly Recommended! No instructions included! For installation of transmission coolers and electric fans. Water temp gauge radiator hose sensor adaptor temperature 26mm 28mm 30mm 32mm 34mm 36mm 38mm 40mm Features Size: 26mm 28mm 30mm 32mm 34mm 36mm 38mm 40mm 100% Brand New. High-quality, lightweight, and durable; great as replacement or upgrade from factory parts. Simple installation, no modifications required. Fan can be used as pusher or puller with the adaptable mounting kit. How to choose the correct fan?step 1:confirm the width and depth of your radiator step 2:compare the fan diameter and depth with radiator Step 3: Choose the right size fan ATTENTION:It can be installed only if the diameter of the fan is smaller than the width of radiator! Make sure the depth of the fan is smaller than the gap of radiator and other parts! Dewhel Aluminum Black Water Temp Meter Temperature Gauge Joint Pipe Radiator Sensor Adaptor Clamps 38mm - Kit contains 4 plastic rods with hardware. Surface with anodized Finish To Improve Strength & Durability. Kit contains nylon mounting rods foam pads and locking buttons. Direct fit & easy installation】this kit includes everything you'll need to hook up to your fan, wires, includes a brass adapter to install the sending unit, relay switch, circut breaker, terminals and mounting screws. Premium quality】new 175-185 degree electric fan thermostat relay switch kit for your cooling system, sending Unit Thread Size: 3/8-18 NPT, Voltage: 12 V. Working】this kit is set up to turn your electric fan on at 185 degrees and shut off at 175 degrees and will work with any 12 volt system. Partsam - It is a 3/8" pipe thread. Blade length: 10inch;number of Blades: 10 ;Blade Type: S. This kit is perfect for any of our 10", 12", and 16" inch fans, 14", as well as our dual fans. It activates your fan when the temperature reaches 185 degrees and turns off at approximately 170 degrees. If you get any problems with our this Electric Cooling Fan Thermostat Kit, please contact us in the first time, we will response within 12 working hours. Overall diameter:1075 inch, installation stand:5. 98 inch, overall thickness:2. 56 inch ;1250 cfm car cooling fans:amp draw: 6-7 amp ;Watts:80W. Kit contains nylon mounting rods foam pads and locking buttons. It activates your fan when the temperature reaches 185 degrees and turns off at approximately 170 degrees. Partsam 170 To 185 Degree Electric Thermostat Temperature Switch Fits 10" 12" 14" 16"Cooling Fan - This kit includes everything you'll need to hook up to your fan, relay switch, circut breaker, includes a brass adapter to install the sending unit, wires, terminals and mounting screws. Fits for 265 283 305 307 327 350 383 400 396 402 427 454 472 502 260 289 302 351w 347 352 360 390 406 427 428 429 460 351c 351m 400m 273 318 340 360 361 383 400 413 426w 440 455 330 326 Engines. High-quality, lightweight, and durable; great as replacement or upgrade from factory parts. Simple installation, no modifications required. Fan can be used as pusher or puller with the adaptable mounting kit.